It’s 2012. Professor Barbara F. Walter has been at the School of Global Policy and Strategy (GPS) for more than 15 years. 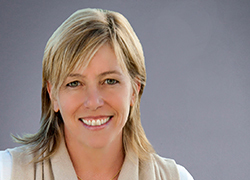 During that time she’s mastered how to teach the core course required of all incoming master’s students—so much so that, among other reasons, she’s to be bestowed the 2012-2013 UC San Diego Distinguished Teaching Award. Although her excellence in the classroom seems clear, she’s faced with a feeling of uncertainty and unease. For the past six months, she’s been preparing to launch a new blog, Political Violence @ a Glance, that will attempt to analyze pressing problems related to violence and protest in the world’s conflict zones. With a quick keystroke, the first post is sent out into cyberspace. The anticipation sets in for Walter; fellow blog co-founder Erica Chenoweth, associate dean for research at the Josef Korbel School of International Studies at the University of Denver; and the undergraduate student they’ve enlisted as the site administrator. Will anyone read it? Will anyone care? Cut to two weeks later, and Political Violence @ a Glance is seeing as many as 2,000 hits per day. The Daily Beast is republishing posts. Then, in its first year, the blog wins the International Studies Association (ISA) Award for Most Promising New Blog. The accolades—and publicity that comes with them—not only are a testament of Walter’s stature in the international security sector but also of her value to GPS, a value that’s evolved in her nearly 20 years at the School. “On the one hand, a lot of things are really similar,” she said, reflecting on her tenure. On the other hand, things have changed. Since she was a Ph.D. candidate in political science at the University of Chicago, Walter has studied almost every aspect of civil wars from 1945 to present, from how they start to why they tend to recur. What piqued her interest was the end of the Cold War. “It was 1990, and the story everyone was telling was it’s going to be peaceful time, yet these small wars were breaking out,” she recalled. The most popular explanation for the civil wars in areas such as Somalia, Yugoslavia and former Soviet Republics was longstanding tribal hatreds. As she set out for answers, it quickly became clear that there was little data on civil wars to work from. Walter sought to fill the void, piecing the origins and resolution of civil wars together like a puzzle. She began by analyzing the conflicts as a “two-player game,” looking at the behaviors of governments and single rebel groups. She’s put those findings in print in her dissertation, “Negotiating Settlements to Civil Wars” and later in her books “Committing to Peace,” published in 2002, and “Reputation and Civil War,” published in 2009. Now, the puzzle she is looking at is inter-rebel group dynamics, examining rebel groups’ relationships with each another, the local populations and their differing ideologies. It’s an area she’s had the opportunity to delve into deeply as part of her recent yearlong sabbatical from the School. Beyond launching her newest project on rebel group strategies, Walter also spent a part of her sabbatical finding balance with her growing demands as a high-level consultant in Washington, D.C. In recent years, she’s traveled to the capitol three to four times annually for consulting. For instance, she also has addressed the U.S. State Department and U.S. Central Command on Syria, Iraq, Yemen and Libya. “Being an expert on a topic that’s been very relevant over 20 years and is going to continue to be relevant has made my research exciting and my career very rewarding,” Walter explained. 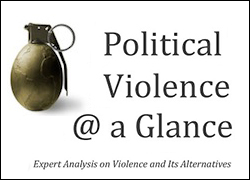 She added Political Violence @ a Glance has only propelled that relevance. In addition to Walter and Chenoweth, the blog now has an extensive contributor list and also receives unsolicited material for consideration to post. It consistently is recognized by ISA. Acknowledging those successes, Walter said the anticipation surrounding the blog has shifted from whether or not people will read it to how it will expand from here. There’s certainly potential for it to grow into a bigger operation with a full-time staff, but it lacks the budget for that at this point, she clarified.